Check out some photos from the Blizzard and Big Boys Toys displays from the Diamond Comics Booth at Toy Fair 2018. Big Boys Toys has posted a preview of their super-deformed Street Fighter T.N.C-04 Guile Diorama Figure. This miniature stylized version of Guile will include a diorama backdrop that depicts his stage from Street Fighter 2, which will connect with the dioramas of the other figures. Much like the previous Ryu, Ken and Chun-Li releases, this will likely feature LED light up features and sound effects. The prototype seen in the images is listed as 80% complete. We’ll update when more images become available. See the preview photos by reading on. Known for her speed Chun Li was by far the fastest character when she debuted in Street Fighter II, a trait showcased by her special ability ‘Hyakuretsukyaku’ – commonly known as ‘Hundred Rending Legs’ or ‘Lightning Kick’ in English. Just like the previous figures in official Street Fighter The New Challenger series Chun-Li’s signature ability is showcased in a very flashy and spectacular way! When the button found on the stand is pressed a single kick lights up and plays, but when you hold the button down a continuous series of kicking effects light up just like you would expect to see in-game! Read on to see a few images, as well as a video demonstration of the light up LED effect. Here’s the first look at the upcoming TNC-03 Street Fighter Chun Li SD Diorama by Big Boys Toys. The images showcase a sculpt that is 70% complete. Chun Li will include a diorama base depicting her stage from Street Fighter 2. She will also include sound effects. We’ll have more info as it becomes available. Big Boy Toys has released a new preview video. It showcases the light up LED and sound effects for their upcoming T.N.C.-02 Ken. This stylized diorama display has Ken performing his iconic flaming dragon punch, and includes a backdrop of his Street Fighter 2 stage. When a button on the stage is pressed, the flames light up and Ken shouts “Shoryuken“. It’s scheduled for release in October or early November. It will sell for about $91 USD in Japan. Check out the video below. Check out the new Street Fighter Ken Masters SD Diorama. This piece comes from Big Boy Toys, a newer company based in Hong Kong. They previously released a Ryu, and the T.N.C.-02 Ken will be their second release. 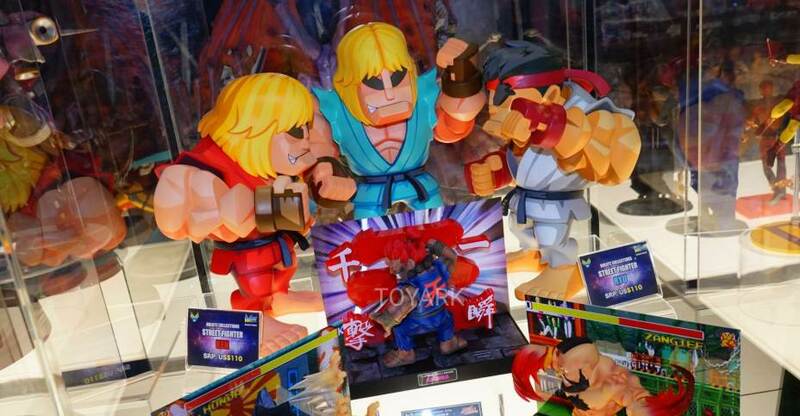 The PVC statue of Ken captures the original World Warrior as he performs his iconic Shoryuken. The flames on his fist feature LED lights and the base will also offer sound effects. It will stand roughly 8.6″ tall. T.N.C.-02 Ken due for release in late October or early November. It looks like it will sell for about $90 USD.